The Royals are up 2-0 in the ALDS. Thoughts after Games 1&2, and looking toward Game 3. The Royals are one win away from the American League Championship Series. Just let that settle in. A week ago Friday, the Royals were spraying champagne in the visitors’ dugout at US Cellular field celebrating their first playoff berth in 29 years. It marked the end of an exhausting month duking it out with Detroit, Oakland, Seattle and Cleveland for the last remaining playoff spots. We were like Charlie Bucket entering Willy Wonka’s Chocolate Factory – others may have felt entitled to their playoff spot, but we’re were kinda just happy to be there. I alluded to this in my post following Tuesday’s Wild Card win, but I’ll say it more explicitly here: I always thought we would lose the Wild Card game. From the beginning of this season, I thought this was a playoff team, but I didn’t think we were most likely to win the Central. And everything in my experience as a Royals fan speaks to the narrative of disappointment. Losing the Wild Card matchup would have been the ultimate disappointment. I expected it. Then they won again on Thursday thanks to incredible outfield defense from Nori Aoki and Lorenzo Cain and a huge 11th-inning home run from Mike Moustakas. Then they won again on Friday thanks to Yordano Ventura completely shutting down the Los Angeles Angels’ star-studded power lineup and another huge 11th inning home run – this one from Eric Hosmer. One week. It’s been an exhausting one, hasn’t it? Not sure about you, but I’ve averaged around 4 hours of sleep over this past week. I was at Tuesday’s game that lasted 4 hours and 45 minutes. Didn’t get home until 1AM, and I was so jacked up there was no way I was getting to bed immediately. Thursday night’s 11-inning affair finished up at 12:13PM. Friday’s ended at 12:26PM. Even then, it’s just not possible for me to sleep well (or at all) after such dramatic ballgames. It isn’t purely sleep deprivation though, is it? It’s been emotionally draining too. This is the first time in MLB postseason history that a team has won three consecutive extra inning games. This is the only time a team to play three straight 11+ inning games too. Only five other teams have won three total extra inning playoff games before this year: 86 Mets, 91 Twins, 96 Yankees, 03 Marlins, 04 Red Sox. See anything in common in that list? Oh, just that all of those teams won the World Series. So there’s that. The Royals have an opportunity to sweep the “best team in the American League” (although that’s open for debate at this point) tonight. They are 1 win away from playing in the American League Championship Series and 5 wins away from the World Series and 9 wins away from being 2014 World Series Champions. THIS IS REAL PEOPLE. IT’S HAPPENING. It’s been a crazy, exhausting and thrilling week, yes? I don’t know how I can survive the rest of this month. And if I don’t, it’s probably already been worth it. When I heard the news that Jason Vargas would be starting Game 1, I was not thrilled. Vargas had a terrible September: a 9.00 ERA in his last 4 starts of the season. I saw his final start in person in Cleveland actually. He doesn’t throw hard, so he has to rely on his pinpoint control, and he did not have it that night. I wanted Danny Duffy instead, but the Royals know their team better than I do. Apparently. And Yordano. Oh, Yordano. The dude is just insane. I’ve never seen him nastier. He was throwing straight fire. 102 with movement just isn’t fair. Before Friday, the most 100+ MPH pitches he’d thrown in one game was 5. Friday night, he threw 12. TWELVE different pitches at or over 100 MPH. He only threw 95 pitches, so that’s 12.6% of his pitches! I tell you what, it’s nice to have a rookie like that. Get him a contract extension ASAP. These two were Dayton Moore’s poster boys. The first round picks in 2007 & 2008 were supposed to come in and change the landscape of Royals baseball for years to come. Unfortunately, they’ve mostly stunk. Especially Moose. Moustakas had a stint in Omaha this summer. The team went on a giant winning stretch while Hosmer was on the disabled list in July/August. I’ve personally lobbied for both of them to be benched at some point this season. Christian Colon has played well in his time in the majors this year, and Danny Valencia did a fine job platooning with Moose before we traded him to Toronto. Billy Butler’s resurgence while Hosmer was out sparked lots of questions whether Hos would get his position back when he returned. But wouldn’t you know it, the first two games of the ALDS are won off of 11th inning home runs from each of them. They’re the heroes of the ALDS so far. I’m curious how Friday’s game impacts Moose’s career in the long term. We know he can hit – he does it in Spring Training year after year. He has always put so much pressure on himself to perform that his average slips around .200-.220. But the last few weeks we have seen a different Moose in my opinion. He’s amped up to play. He’s taking the ball to the opposite field regularly to beat the shift. He even pushed a bunt single down the line on Friday. Pure gold. I have a sense – and we’ll see how this plays out – that Moose is more relaxed than he has ever been in his career after the home run last night. I’m betting that we continue to see a productive Moose throughout the playoffs and into next season. At least, I hope. I’ve already addressed how annoyed I get with the Royals fan base hating Ned Yost. And he’s not flawless, obviously. But I think we just enjoy hating him at this point. No one seems to be arguing about the lineup since Omar Infante got moved down and Cain moved up. The only situation that seems to get criticized now is the use, or lack thereof, of Greg Holland in the 9th inning in the last three games. In the Wild Card game, with the Royals losing 7-6, Yost brought in Holland in the 9th at home before the Royals tied the game up in the bottom half. Makes perfect sense because if he doesn’t use him and we don’t score then you’ve neglected your best bullpen arm in the end. In the last two games, with the game tied, Yost has chosen to go with Jason Frasor and a Tim Collins/Frasor combo. He kept Holland for the 11th inning in both games. Typically, in a tie game on the road, you’d throw your closer in the 9th, get three outs and make sure the game goes to extras. Use your best arms and resort to the lesser arms when/if you have to. No sense in throwing the game away by putting in a lesser pitcher instead. But here’s the rub with that logic: you’re going to have to throw your worse arm if you want to win anyway. Even if Yost decided to throw Holland in the 9th, then Moose/Hosmer hits their homer in the 11th, he would then turn to Frasor and/or Collins for the bottom of the 11th. You’d rely on the same pitchers, just at different points of the game. So, hypothetically, if Collins had blown it in the 9th, we’d all be blasting Yost for not bringing in Holland instead. Except, if he does bring in Holland and he’s successful, you’re going to have to trust Collins later anyway. It’s a half foot one way, six inches the other. It boils down to preference, really. Would you rather save your best guy for when you have a lead or throw him to sustain the tie? The lesser-than-Hollands are going to have to throw at some point anyway. Personally, I’d much rather see Holland in there in a save situation in the 11th than Tim Collins or Jason Frasor, and I think you would too. Wouldn’t we rather have a shutdown guy ready to go once we took the lead? A lead is a win with Holland out there still. A lead is still somewhat in question when turning to Collins/Frasor. Note to Yost: keep doing what you’re doing with Holland. Also, proud of you for bringing in Davis in the 7th. And if Herrera is out long term, the answer is either lefty Brandon Finnegan or righty Jason Frasor depending on the matchup. The Angels hit Shields very well. Howie Kendrick especially: 14-26 (.538/.556/.855). In fact, it seems like anyone on this team who has faced Shields much has had some success against him. Albert Pujols is 3-6 vs Shields. 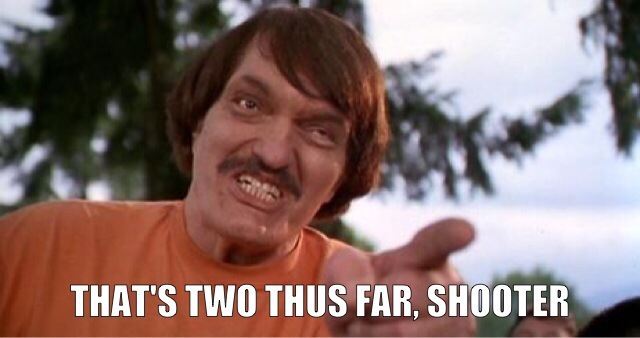 Mike Trout is 2-6…with a 3B and a HR. That’s a .333/.333/1.167 split. Except Josh Hamilton. He stinks versus BGJ. I would not be shocked to see Hamilton get benched today. He is hitless so far in the series, got booed loudly during Game 2 in Los Angeles, and lifetime against Shields he is 3-25 with 11 strikeouts. Collin Cowgill is 0-3 lifetime against Shields, but played 44 games out in LF this season, mostly while Hamilton was out during September. If I were Mike Scioscia, I’d bench Hamilton for Cowgill. The biggest difference is that Shields (3.21 ERA) hardly walks anyone while Wilson (4.51) walks a lot. Except the Royals this year finished dead last in the majors in walks taken. Patience at the plate (looking at you, Salvy and Lorenzo) will reap it’s benefits against Wilson. Wilson also pitches significantly worse on the road (4-8, 5.31 ERA) than at home (9-2, 3.82 ERA). So that works in our favor as well. Shields is obviously the better pitcher, especially with Wilson pitching on the road, but I’m more nervous than usual with Shields against the Angels. Okay that’s enough for now. We’ll pick it back up after they sweep the best team in the American League tonight. But let’s be honest, are they still the best team? I’m predicting a 6-3 Royals win. Until then, I’ll be listening to Tech N9ne and J-Lo’s “Waiting for Tonight” on loop. See you at Kauffman. Let’s get weird.